If you've never heard of skimming, it's one of the sneakiest scams ever to steal your credit card information and then empty your bank account or max out your credit card. The US Secret Service investigates cyber crimes that include skimming. Recently, they've found that skimming is spreading across North Carolina in Greensboro, Asheville, Charlotte and more areas every day. In this fraud alert, we'll take a look at skimming, where to look out for it and how to protect yourself. Credit and debit card skimming is a clever fraud because you are the one that inadvertently hands over your card info to the thief without ever knowing it. Skimming starts with a device that's attached to a gas pump or ATM and when you slide your card, the information from your data strip is read and recorded by the device. Skimming thieves will also plant a pinhole camera to record your PIN code or zip code as you enter it at the ATM or the gas pump. With the magnetic strip data and your zip code (for credit cards) or PIN number (for debit cards), thieves are poised to do you great financial damage. While gas pumps and ATMs are the most common target of skimming, Redbox machines have also been targeted. Credit card skimming is one of the most difficult types of fraud to detect because your card is never out of your hand, stolen nor lost. You're more careful when your card leaves your hand at a restaurant, but when it's in your hand, it feels safe, and you're less likely to be on your guard. But there are still some ways to protect yourself from potential skimmers. First is to avoid the ATM altogether. If you need cash back, get cash back at the register. 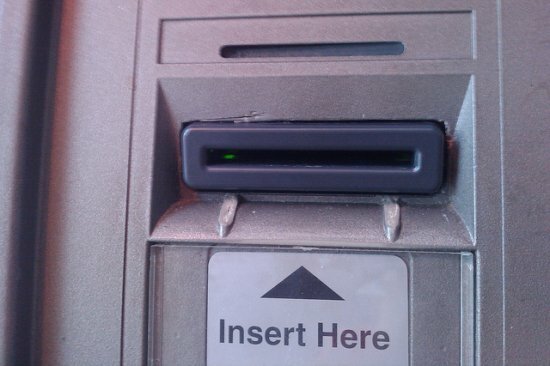 This is smarter anyway since many thieves lurk around ATMs looking for easy targets. Second, at the gas station, skip pay at the pump and go inside to pay where you can swipe your card yourself or watch the cashier do it. Third, anywhere else you swipe your card, look closely at the device before you insert your card. Scratches are a warning sign as are objects that don't look like they are part of the original equipment. But more sophisticated skimmers may be very hard for you to detect. Check out the police-prepared video below to see how these devices work and how to spot them. You may not be able to protect yourself from skimming, but you can be on the look out for the after-effects. Regularly monitor your credit card and bank accounts for balance changes. If possible, set up alerts so that charges over a certain amount or certain balances will notify you via text or email. Timely notice of fraud is critical because you only have a limited window of time to notify your card issuer and recover lost money or reverse unauthorized charges. It's always a good idea to monitor your bank and credit card accounts to protect yourself from identity theft and fraud. When you're deep in debt you can no longer afford to pay and need a serious intervention, we can help. Contact the law offices of John T Orcutt for a free consultation on how North Carolina bankruptcy can help you. We have offices in Raleigh, Durham, Greensboro, Fayetteville, Garner, and Wilson. Call 1-888-234-4181 and ask about our zero-down bankruptcy specials.